As the month draws to an end so does our spring bucket list, ours ran from the begining of March through to the end of May. Every year we have a list of things we'd like to do, but somehow never get around to, in the past we've found it difficult to fit these things in as the season passes and we've missed out - again. Until we discovered the bucket list concept! I try to get the whole family involved but sometimes getting the teens to think of ideas is impossible, so generally I come up with a list and ask anyone if there's anything they'd hate or if they have any suggestions, sometimes when they see some ideas they come up with others. Each season I feel as though we are improving on achieving our activities, although our winter bucket list was a complete disaster - I'd based most of it round snow and we had none this year!!! Oh well we live and learn! I think that one reason for us achieving most of our list was down to the fact that I'd included a number of bucket list activities into our spring break week staycation, I'm sure this helped no-end and it meant we had a jam packed budget week of activities and fun. I also turned to the bucket list for T friendly activities when planning things to do at the weekend. I also make sure that the list is displayed somewhere prominent (in my planner and on the kitchen wall!) so that it's a constant reminder. 1 pet baby animals - during our spring break week, we visited a local garden nursery which had a small pet corner, K liked this the most very closely followed by H and T wasn't bothered at all probably because he has all the animals at his nursery, he just tried to catch the chickens! 2 fly a kite - well for anyone who follows my instagram feed, you will have seen the ridiculous kite that I got for a 'bargain' on eBay, it was tiny! But it didn't stop T and I going in the garden and giving it a go, it didn't really fly high but it's size did mean that T could hold it in the strong wind, so we had fun! 3 Easter play date - we hosted our play date which was a great sucess and are becoming a bit of a tradition, you can read all about it here. 4 attend a new club - I'm pushing the boundaries slightly on this one! We were booked on a local cookery course, but unfortunately had to pull out when I was ill during April. T's nursery had 'what I want to be when I'm a grown-up' week last week, on Monday they were visited by a local ex-footballer who runs tots football sessions. T loved the football session he had at nursery so much that we are intending on signing him up, so although not quite 'attended' we have found a club so I'm counting it. 5 have family over for roast dinner - speaks for itself, we entertained K's family for Easter lunch and had a lovely time. 6 hunt for frogspawn - sadly this is one that we missed as I didnt plan it in early enough, we can usually guarantee frogspawn in our pond but there was none this year, either the frogs can't stand the filth in our pond or as I've just seen on Springwatch, there's a decline in frogs in the UK, anyway by the time I realised the frogs weren't coming to ours, spawn elsewhere had already hatched!! 7 put marbles in gate - this sounds a bit of a weird one, but I saw it on pinterest. You drill holes in the gate and poke in opaque marbles so when the sun shines through it looks really pretty. Well I have the marbles (actually I've got those glass pebble things for flower arranging) and we just need to pop them in the gate, this will be done, just not before we wrap up. 8 play silly family games - what a hoot we had playing 'minute to win it' games, if you've never heard of it and have teens look it up on YouTube, we had a fantastic night, our teens really enjoyed themselves and I expect we'll be doing this again. 9 put up a new birdhouse - well I know I've got one somewhere but do you think I could find it in the skip that we call the garage? We didn't achieve this one and so it will go on the list for next spring. 10 blow bubble snakes - again this was a pinterest find, T wasn't bothered but H and I had lots of fun! 11 T's own garden area - we made T a portable garden, you can find the blog post here, I'll be putting up a follow-up blog post on T's garden soon as it's really doing well. 12 have a picnic - during our spring break week we went for a picnic, we actually ended up sitting by the car (well T was in the boot!) but it was a picnic nevertheless! 13 plant sunflowers - T and I sowed sunflowers and I planted them out, we did a review on the seeds we used which you can read here. 14 run through bluebells - when we first went to see the bluebells hardly any were out so The Hubs, T and I went a few weeks later, we had a fab time at the woods, playing in the beautiful bluebells, but I'd love to take the teens next year (if they'll come!) we stopped on a log right on top of a big badger set for some chocolate and a drink, it was so peaceful and lovely. 15 stargaze - this was almost a fail as I completely under-estimated when the sun goes down now and so it's really been too late to do this with T, I'm marking this one down as a half as T and I did talk about the stars and on Sunday we did look into the sky, albiet only seeing a couple of stars. I'm transferring this one to our autumn bucket list. We have a star on Orion's Belt which is named after The Hubs late father, I'd love to show T where it is so he'll grow up always knowing, that's his Grandad's star. And so that's a wrap, sorry I've gone on a bit. 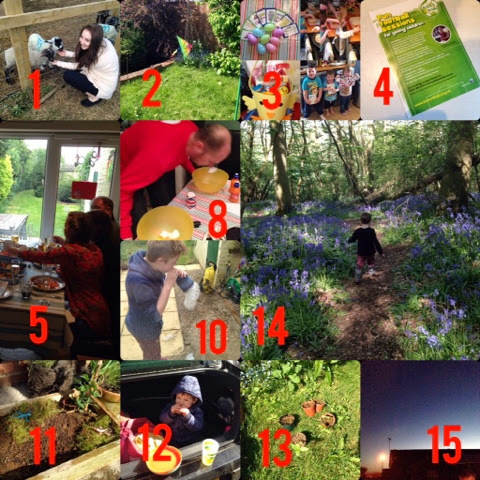 I hope that you have had a spring packed with activities and fun like we have, I feel proud that we've really tried to make the most of the season which has lead to a rather optimistic summer bucket list, but I can't wait to dive right in. 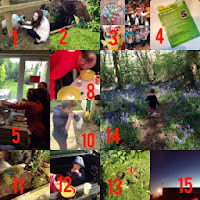 I'll be posting our summer bucket list on Sunday 1 June if you are interested and if you'd like some inspiration you can follow our summer bucket list inspiration board, even though I have my list, I'll still be posting to that!